Kyel Reid and David Mooney scored the goals against Yeovil to give Charlton a first win in six matches and get the Addicks' promotion bid back on track. The visitors should have taken the lead but Sam Williams shot tamely at the keeper from Dean Bowditch's pass. And Charlton dominated thereafter, taking the lead when Reid strolled forward and fired in a 30-yard drive. Mooney wrapped things up in the 54th minute when he collected Deon Burton's pass and fired in a first-time shot. "It was a big win for us, we have not not being playing well recently." "Today we got back to passing the ball and having more composure in our playing." "We got a clean sheet and one of the reasons for that is because we passed the ball more to each other. We got back to a resemblance of how I know we can play." "We started very well and created two or three really good chances, but again it seems that we kept huffing and puffing and were not clinical enough. "If you're not clinical and the other team gets a goal up at a place like Charlton then you're never, ever going to get a game back. "We've known for a little while now that this is a relegation battle and we have to keep our head above water." 90:00+3:58 Direct free kick taken by Gavin Tomlin. 90:00+3:58 Booking Booking for Christian Dailly for unsporting behaviour. 90:00+3:47 Unfair challenge on Dean Bowditch by Christian Dailly results in a free kick. 90:00+2:42 Dean Bowditch concedes a free kick for a foul on Kyel Reid. Direct free kick taken by Nicky Bailey. 89:50 Substitution Jose Vitor Semedo joins the action as a substitute, replacing Therry Racon. 89:13 Short corner taken by Gavin Tomlin from the right by-line, The ball is delivered by Shaun MacDonald. 88:59 Gavin Tomlin takes a shot. Save made by Rob Elliot. 86:35 Unfair challenge on Therry Racon by Terrell Forbes results in a free kick. Free kick taken by Nicky Bailey. 85:44 Frazer Richardson delivers the ball. 84:29 JP Kalala challenges Nicky Bailey unfairly and gives away a free kick. Rob Elliot restarts play with the free kick. 83:45 Inswinging corner taken right-footed by Gavin Tomlin from the left by-line to the near post, clearance by Nicky Bailey. 82:54 Free kick awarded for a foul by David Mooney on Nathan Smith. Gavin Tomlin takes the direct free kick. 82:37 The ball is sent over by Gavin Tomlin, Christian Dailly makes a clearance. 82:08 Substitution Kieran Murtagh joins the action as a substitute, replacing Owain Tudur Jones. 81:44 Booking Nathan Smith receives a caution. 80:30 Centre by Craig Alcock, clearance made by Therry Racon. 79:38 The ball is crossed by Gavin Tomlin, save made by Rob Elliot. 77:43 The referee blows for offside. Miguel Angel Llera takes the indirect free kick. 76:05 The official flags Dean Bowditch offside. Christian Dailly takes the indirect free kick. 75:16 Indirect free kick taken by Alex McCarthy. 75:16 Substitution (Charlton) makes a substitution, with Scott Wagstaff coming on for Lloyd Sam. 75:16 The assistant referee signals for offside against Deon Burton. 75:06 Kyel Reid delivers the ball. 73:11 JP Kalala crosses the ball, save by Rob Elliot. 72:21 JP Kalala produces a right-footed shot from just outside the box that misses to the right of the net. 71:52 Therry Racon sends in a cross, clearance made by Steven Caulker. 69:54 A cross is delivered by Kyel Reid, Gavin Tomlin manages to make a clearance. 69:39 The ball is swung over by Kyel Reid, clearance made by Steven Caulker. 68:37 Substitution JP Kalala is brought on as a substitute for Arron Davies. 65:59 David Mooney takes a shot. Blocked by Steven Caulker. 65:31 Deon Burton takes a shot. Save by Alex McCarthy. 64:31 Corner taken by Arron Davies, Rob Elliot makes a save. 64:18 Gavin Tomlin takes a shot. Save by Rob Elliot. 62:24 Craig Alcock fouled by Deon Burton, the ref awards a free kick. Alex McCarthy takes the free kick. 61:45 Johnnie Jackson takes the outswinging corner, Gavin Tomlin manages to make a clearance. 61:17 Corner from right by-line taken by Johnnie Jackson. 61:08 Nicky Bailey crosses the ball, clearance made by Steven Caulker. 60:03 Substitution Gavin Tomlin is brought on as a substitute for Andrew Welsh. 59:41 David Mooney produces a right-footed shot from the edge of the area and misses to the left of the goal. 59:31 Kyel Reid produces a cross, Alex McCarthy makes a save. 58:44 Corner taken left-footed by Andrew Welsh from the left by-line to the near post, Frazer Richardson manages to make a clearance. 58:26 The ball is sent over by Andrew Welsh, Sam Williams takes a shot. Save by Rob Elliot. 57:09 Inswinging corner taken right-footed by Arron Davies played to the near post, clearance by Miguel Angel Llera. Inswinging corner taken from the left by-line by Arron Davies, Craig Alcock takes a shot. Corner taken by Arron Davies, clearance by Miguel Angel Llera. Blocked by Johnnie Jackson. 56:49 Arron Davies takes a shot. Rob Elliot makes a save. 54:55 The referee blows for offside against Deon Burton. Alex McCarthy takes the indirect free kick. 53:39 Therry Racon provided the assist for the goal. 53:39 GOAL - David Mooney:Charlton 2 - 0 Yeovil David Mooney fires in a goal from deep inside the penalty box to the top left corner of the goal. 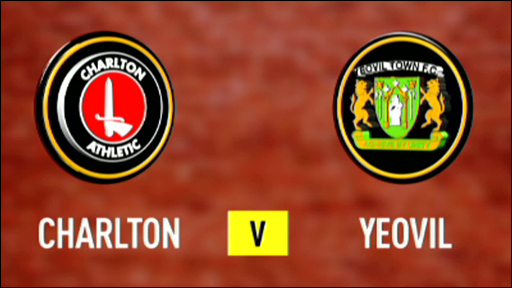 Charlton 2-0 Yeovil. 52:26 The ball is crossed by Andrew Welsh, Rob Elliot makes a brilliant save. Correction - 51:28 Free kick awarded for a foul by Miguel Angel Llera on Sam Williams. Craig Alcock takes the direct free kick. 51:28 Miguel Angel Llera challenges Sam Williams unfairly and gives away a free kick. Craig Alcock takes the direct free kick. 50:04 Arron Davies challenges Kyel Reid unfairly and gives away a free kick. Miguel Angel Llera takes the direct free kick. 49:41 The ball is sent over by David Mooney, Steven Caulker makes a clearance. 47:27 Kyel Reid sends in a cross, clearance by Nathan Smith. 46:58 Andrew Welsh produces a cross. 46:25 Corner taken by Arron Davies from the right by-line played to the near post, clearance by Frazer Richardson. 45:15 Kyel Reid concedes a free kick for a foul on Shaun MacDonald. Free kick taken by Alex McCarthy. 44:44 Shaun MacDonald concedes a free kick for a foul on David Mooney. Direct free kick taken by Christian Dailly. 44:09 The ball is sent over by Therry Racon, save made by Alex McCarthy. 43:44 Lloyd Sam takes a shot. Blocked by Terrell Forbes. 42:27 Foul by Frazer Richardson on Owain Tudur Jones, free kick awarded. Andrew Welsh crosses the ball in from the free kick, save by Rob Elliot. 42:12 The ball is crossed by Craig Alcock, Frazer Richardson manages to make a clearance. 39:47 Effort on goal by Lloyd Sam from long range goes over the bar. 38:23 Craig Alcock has an effort at goal from outside the penalty box which goes wide left of the goal. 37:33 Miguel Angel Llera challenges Sam Williams unfairly and gives away a free kick. Craig Alcock takes the direct free kick. 36:42 Unfair challenge on Deon Burton by Steven Caulker results in a free kick. Free kick taken by Rob Elliot. 36:23 Corner taken by Arron Davies from the right by-line, Craig Alcock takes a shot. Rob Elliot makes a save. 35:33 Kyel Reid delivers the ball, clearance by Steven Caulker. 34:19 Free kick awarded for a foul by Sam Williams on Christian Dailly. Christian Dailly takes the direct free kick. 33:56 Effort by Nicky Bailey from a long way out goes over the target. 32:56 The referee blows for offside. Alex McCarthy takes the indirect free kick. Correction - 31:56 Unfair challenge on Nathan Smith by Deon Burton results in a free kick. Alex McCarthy takes the direct free kick. 31:56 Foul by Deon Burton on Nathan Smith, free kick awarded. Free kick taken by Alex McCarthy. 28:47 Deon Burton provided the assist for the goal. 28:47 GOAL - Kyel Reid:Charlton 1 - 0 Yeovil Kyel Reid gets on the score sheet with a goal from outside the penalty box to the top left corner of the goal. Charlton 1-0 Yeovil. 27:52 David Mooney produces a right-footed shot from deep inside the six-yard box which goes wide of the right-hand upright. 27:11 Effort from long distance by Sam Williams goes wide right of the target. 26:02 Nathan Smith sends in a cross, clearance by Johnnie Jackson. 25:48 Craig Alcock delivers the ball. 24:17 Outswinging corner taken from the left by-line by Johnnie Jackson, clearance made by Sam Williams. 23:17 David Mooney takes a shot. Terrell Forbes gets a block in. 19:27 The ball is crossed by Owain Tudur Jones. Correction - 19:03 Sam Williams takes a shot. Rob Elliot makes a save. 19:03 Sam Williams takes a shot. Save by Rob Elliot. 18:14 Handball by David Mooney. Alex McCarthy takes the free kick. 16:16 Free kick awarded for an unfair challenge on David Mooney by Steven Caulker. Johnnie Jackson restarts play with the free kick. 15:41 Craig Alcock produces a cross, Miguel Angel Llera manages to make a clearance. 13:51 The ball is crossed by Kyel Reid, clearance made by Sam Williams. 12:43 Inswinging corner taken by Johnnie Jackson, Steven Caulker manages to make a clearance. 12:21 Nicky Bailey takes a shot. Save by Alex McCarthy. 10:40 The ball is crossed by Frazer Richardson. 10:03 Centre by Kyel Reid, Steven Caulker makes a clearance. 8:43 Nathan Smith challenges Kyel Reid unfairly and gives away a free kick. Frazer Richardson takes the free kick. 8:05 Sam Williams takes a shot. Save made by Rob Elliot. 6:12 The ball is sent over by Johnnie Jackson, Deon Burton has an effort at goal from deep inside the area missing to the right of the target. 5:51 Centre by Lloyd Sam, clearance made by Steven Caulker. 4:18 The assistant referee signals for offside against David Mooney. Alex McCarthy takes the free kick. 3:05 Outswinging corner taken from the left by-line by Johnnie Jackson. 1:31 The ball is swung over by Kyel Reid. 0:50 A cross is delivered by Lloyd Sam, Craig Alcock makes a clearance.